Use this if revenue from a service should be assigned to the practice account, rather than the practitioner’s company. 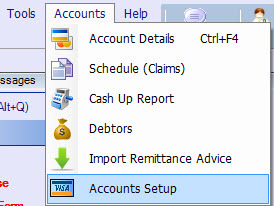 Select Account Setup in the Accounts menu. Open the Service Type tab, and select the service you wish to edit. The Payee receives payment for this service. In their staff details, every practitioner “works for” a business. When the Payee column is blank, the payments for the service are automatically assigned to the practitioner’s business. If the payment should be made to a different account, use the drop-down list to select that account. For example, if all fees for a flu vaccination need to be diverted to the Practice Account, you would select Practice Account in the Payee column.